François Giboin (France-wah Jib-when) is a cognac producer with real personality. Rarely seen without his beret, he comes across as a thinking man’s paysan, quick with a joke, often irreverent, and full of wit. Giboin likes to laugh, and he likes others to laugh with him. When in his cellar, he is sure to put on his blue work jacket, something that gives him the air of a crazy professor. Dozens of partially filled bottles near his alambic reinforce this idea of an experimental laboratory. Indeed many of Giboin’s methods are different, as are the properties he owns. ​Ground zero for Giboin is his Borderies property called l’Hermitage, the 13.5 hectares of vines that surround his stately home. 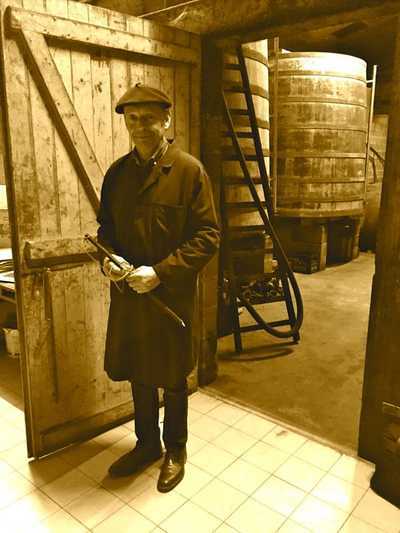 François is the sixth generation producer at the property, whose origin dates to 1830. 11.5 hectares of the plantings are Ugni Blanc and the rest red grapes that will be used for pineau. 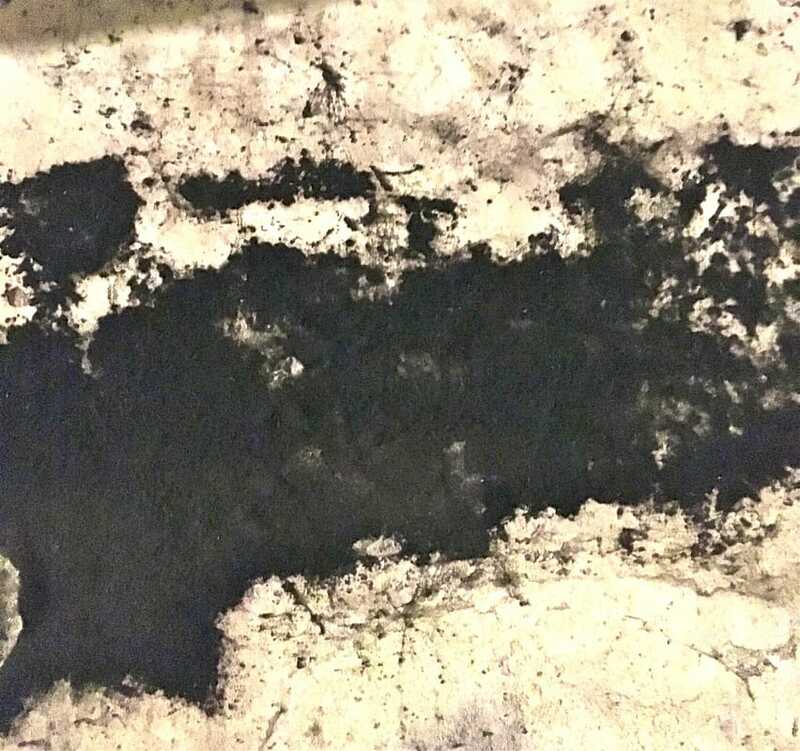 While much of the Borderies soils contain clay and flint stones derived from decomposed limestone, l’Hermitage has a gypsum subsoil topped with brown clay virtually devoid of limestone. Because of the soil’s lower water retention, his vines suffer more than in other areas of the Borderies while yields are generally lower (90 hl/ha with wines at 7.5-8.5%). A lost Robert Motherwell? No, just the famous torula compniacensis mold found in many cellars in the Charente. Giboin’s second property is in the village of Apremont, about 20 kilometers south of Angouleme in the southeastern Fins Bois. Here the soil is drastically different from l’Hermitage, with much more chalk and limestone interspersed with flint. 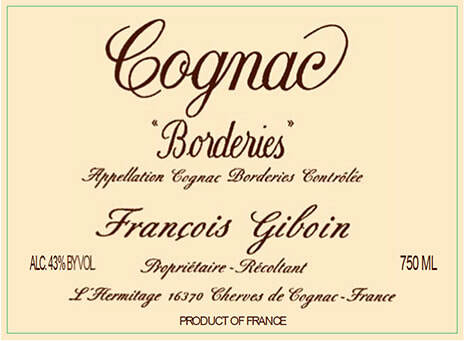 The cognac grapes are pure Ugni Blanc, with yields in the 100-120 hl/ha range with 10% alcohol on average. Giboin harvests his grapes with a machine, and then brings them back to Cherves-Richemont where they are fermented in large cement tanks. Beginning at the end of November, he distills each property separately in his 25 hl pot still. Depending on what the release will be, he either distills with or without the lees. For his younger spirits and pineau, he will filter and distill clear wine. For his VSOP, he distills with the lees and for his cognacs that ​will be aged even longer (Napoleon and XO) he will add lees to have an even more complex, spicy potential. ​Giboin Borderies VSOP (8-10 years of age): Spicy, round and with lots of fruit whose flavors include ginger, orange and plum. 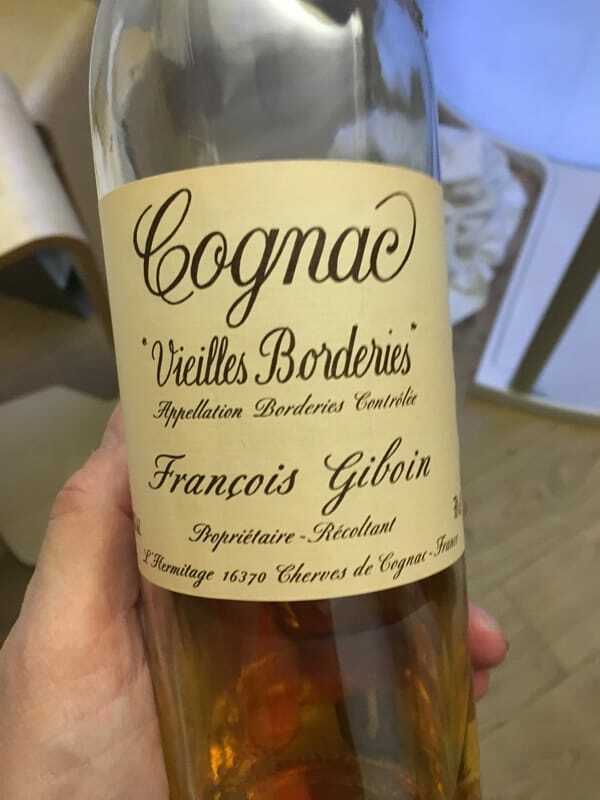 ​Giboin Borderies 1974 (distilled in 1974, aged in barrel until 2005, stored in glass demijohns in the cellars, bottled in the Spring of 2014): Explosive nose includes plum, fig, exotic vanilla, and a hint of violet. On the rich palate, additional notes of tobacco, sweet spices and a touch of coffee mesh on the long, impressive finish. 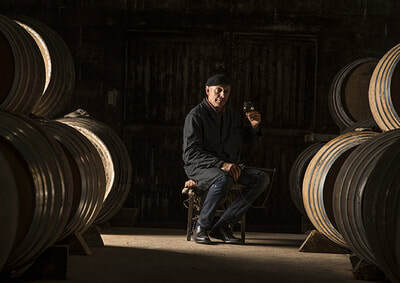 Between 6 and 8 new barrels are purchased each year, and Francois ages his spirits in a somewhat original method. Some spirits begin with 6 months in new oak (labeled A). B barrels are a little older, and eau de vie will rest here for 8 months. 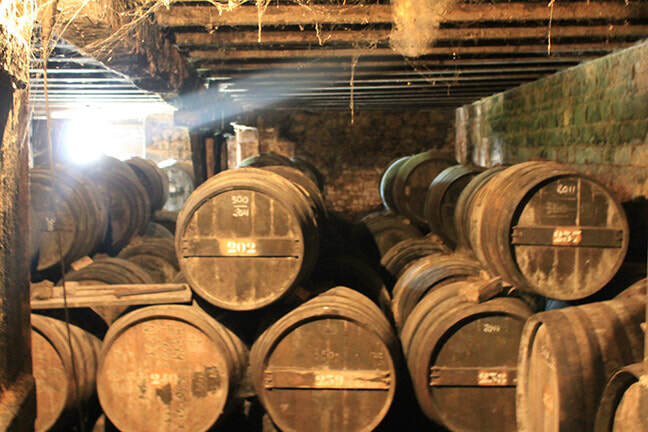 C barrels have held two or three different cognacs, and will see new spirit for 10 months. And D barrels, which are four and five years old, will hold the new spirits for 12 months. 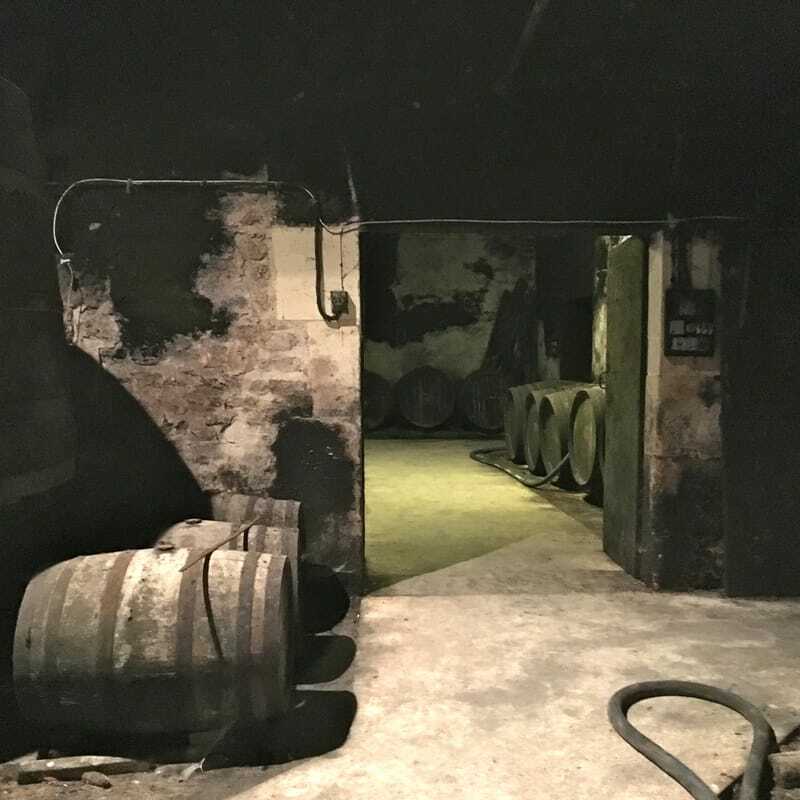 After they have been dosed with the necessary nutrients that new oak gives, they are put into older barrels, that gradually permit slow oxidation and a steady evolution. The cellar is partially underground, dug into the gypsum soils. This provides excellent humidity and a constant temperature during all seasons of the year. Before bottling, blends are made of various vintages and assembled for in large tanks where they marry for 12 months. They are then bottled after a light filtration. Approximately 7,000 bottles (or 20% of his production) is sold annually, either at the property, at trade shows around France, or to other countries including the US and Czechoslovakia. 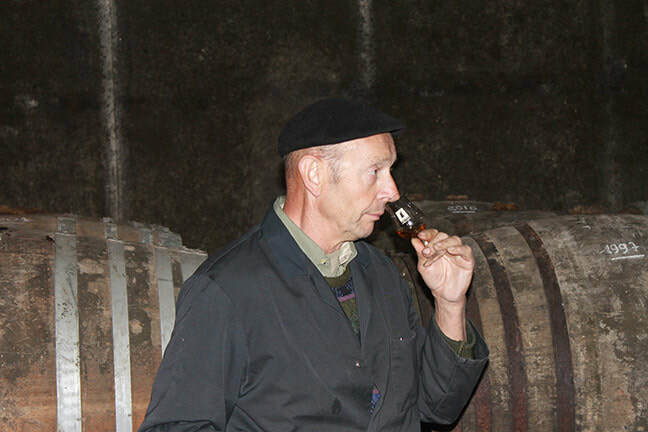 Another 20% of the production is kept on the property to further age and 20% is used for his pineau. What remains (40%) is sold to Coirvoisier for whom he has been a loyal customer for decades.